All Phase Auto is ASE Certified and now an official NAPA Auto Care Center! We are proud to offer our customers complete Auto and Truck repair services ranging from Oil Changes to Engine/Transmission replacements. Our services are directed from our name. We perform All Phases of Auto Service for Domestic, Asian, and European vehicles. All services guaranteed, Our complete vehicle information and management systems are created and proven to keep your vehicle well maintained. We provide the same services the dealer offers at much lower cost. Free Towing with rebuilt engine or transmission. We accept all major credit cards, checks, and cash. 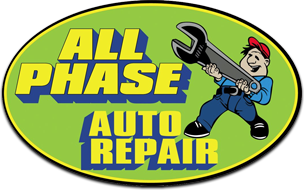 We offer financing for any repair over $300.00 to qualified applicants (90 Day same as cash–no credit check). We accept most after market warranties. We will provide a courtesy ride within a reasonable distance for all customers.